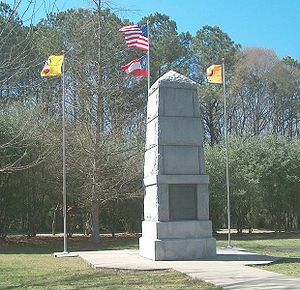 (Right) Cherokee Trail of Tears Historical Marker: The entrance to the Cherokee Removal Memorial Park near Blythe's Ferry, one of the trail's departure points. In 1838, the Cherokee Nation -- with more than 16,000 men, women, and children -- was removed from their lands in the Southeastern United States to the Indian Territory (present-day Oklahoma) in the Western United States, which resulted in the deaths of approximately 4,000 Cherokees (Oklahoma Territory and Indian Territory). In the Cherokee language, the event is called Nunna daul Isunyi—“the Trail Where They Cried”. High Resolution Map of Cherokee Trail of Tears. Main routes Cherokee traveled during Trail of Tears. 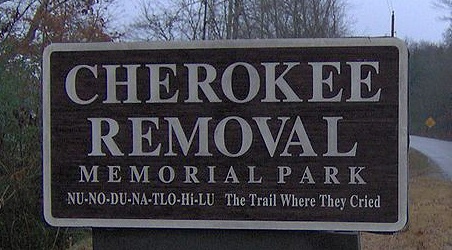 The Cherokee Trail of Tears resulted from the enforcement of the 1835 Treaty of New Echota, an agreement signed under the provisions of the Indian Removal Act of 1830, which exchanged Native American land in the East for lands west of the Mississippi River, but which was never accepted by the elected tribal leadership or a majority of the Cherokee people. Tensions between Georgia and the Cherokee Nation were brought to a crisis by the discovery of gold near Dahlonega, Georgia, in 1829, resulting in the Georgia Gold Rush, the first gold rush in U.S. history. Hopeful gold speculators began trespassing on Cherokee lands, and pressure began to mount on the Georgia government to fulfill the promises of the Compact of 1802. (Left) Cherokee Trail of Tears Historical Marker in northwest Arkansas. When Georgia moved to extend state laws over Cherokee tribal lands in 1830, the matter went to the U.S. Supreme Court. In Cherokee Nation v. Georgia (1831), the Marshall court ruled that the Cherokees were not a sovereign and independent nation, and therefore refused to hear the case. However, in Worcester v. State of Georgia (1832), the Court ruled that Georgia could not impose laws in Cherokee territory, since only the national government — not state governments — had authority in Indian affairs. "John Marshall has made his decision; now let him enforce it! ... Build a fire under them. When it gets hot enough, they'll go." —-Andrew Jackson, 1832, The Trail of Tears Across Missouri. President Andrew Jackson was fully committed to the Indian Removal policy and he had no desire to use the power of the national government to protect the Cherokees from Georgia, since he was already entangled with states’ rights issues in what became known as the Nullification Crisis. With the Indian Removal Act of 1830, the U.S. Congress had given Jackson authority to negotiate removal treaties, exchanging Indian land in the East for land west of the Mississippi River. 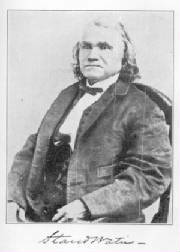 Jackson used the dispute with Georgia to put pressure on the Cherokees to sign a removal treaty. With the landslide reelection of Andrew Jackson in 1832, some of the most strident Cherokee opponents of removal began to rethink their positions. Led by Major Ridge, his son John Ridge, and nephews Elias Boudinot and Stand Watie, they became known as the “Ridge Party”, or the “Treaty Party” (see Indian Removal: Ridge v. Ross). The Ridge Party believed that it was in the best interest of the Cherokees to get favorable terms from the U.S. government, before white squatters, state governments, and violence made matters worse. (Right) This monument at the New Echota Historic Site honors Cherokees who died on the Trail of Tears. 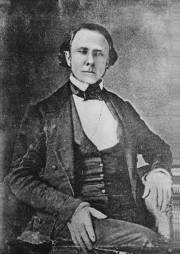 John Ridge began unauthorized talks with the Jackson administration in the late 1820s. Meanwhile, in anticipation of the Cherokee removal, the state of Georgia began holding lotteries in order to divide up the Cherokee tribal lands among white Georgians. 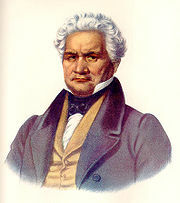 However, Principal Chief John Ross and the majority of the Cherokee people, also known as the Ross Party, remained adamantly opposed to removal. The 1835 Treaty of New Echota relinquished all the Cherokee land east of the Mississippi in return for five million dollars to be disbursed on a per capita basis, an additional half-million dollars for educational funds, title in perpetuity to an amount of land in Indian Territory equal to that given up, and full compensation for all property left in the East. There was also a clause in the treaty as signed allowing Cherokee who so desired to remain and become citizens of the states in which they resided on 160 acres of land, but that was later stricken out by President Jackson. In the fall of 1835, a census was taken by civilian officials of the War Department to enumerate Cherokees residing in Alabama, Georgia, North Carolina, and Tennessee: The 1835 Census of the Cherokee Nation, East (not including the Oconaluftee Cherokee under Chief Yonaguska in Haywood County, North Carolina, who were considered citizens of that state) showed—Georgia: 8946 "Indians", 776 slaves, 68 whites; North Carolina: 3644 "Indians", 37 slaves, 22 whites; Tennessee: 2528 "Indians", 480 slaves, 79 whites; and Alabama: 1424 "Indians", 299 slaves, 32 whites. This made a total of 16,542 "Indians", 1592 slaves, and 201 inter-married whites living in the Cherokee Nation East, for a grand total of 18,335 persons overall. This total includes 376 Muscogee living in the Cherokee Nation East, since the Creek War. The estimated number of Cherokee in the West was about 5000. In October of that year Principal Chief John Ross and an Eastern visitor, John Howard Payne, were kidnapped from Ross' Tennessee home by a renegade group of the Georgia militia. Released, Ross and a delegation of tribal leaders traveled to Washington, D.C., to protest this high-handed action, and to lobby against the removal policy of President Andrew Jackson. In this power vacuum, U.S. Agent John F. Schermerhorn gathered a group of dissident Cherokees in the home of Elias Boudinot at the tribal capitol, New Echota, GA. There, on December 29, 1835, this rump group signed the unauthorized Treaty of New Echota, which exchanged Cherokee land in the East for lands west of the Mississippi River in Indian Territory. This agreement was never accepted by the elected tribal leadership or a majority of the Cherokee people. In February 1836, two Councils convened at Red Clay, TN., and at Valley Town, N.C., (now Murphy, N.C.) and produced two lists totaling some 13,000 names, written in the Sequoyah writing script, of Cherokees opposed to the Treaty. The lists were dispatched to Washington, D.C., and presented by Chief Ross to Congress. Nevertheless, a slightly modified version of the Treaty was ratified by the U.S. Senate by a single vote in March 1836, and signed into law by President Andrew Jackson. The Treaty provided a grace period until May 1838 for the tribe to voluntarily remove themselves to Indian Territory. (Right) John Ross House. 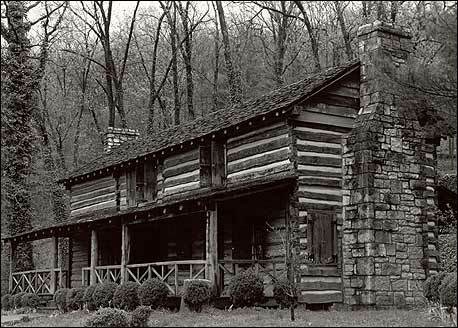 This log house is located in Rossville, Georgia, on the Georgia-Tennessee border near Chattanooga. It consists of two rooms on each floor separated by a central breezeway, now enclosed, and was built in the 1790s by John Ross's grandfather. Ross lived here with his grandparents as a boy and the house later served as a headquarters for the enterprises that made him a rich man. The property also included a large farm, worked by slaves. Ross also owned a supply depot and warehouse at Ross's Landing (now in Chattanooga). (Major Ridge House) The Ridge House is located in Rome, Georgia, near New Echota, the Cherokee national capital. The two windows to the left of the front door were part of the earliest part of this house, a log cabin of two rooms separated by an open breezeway. 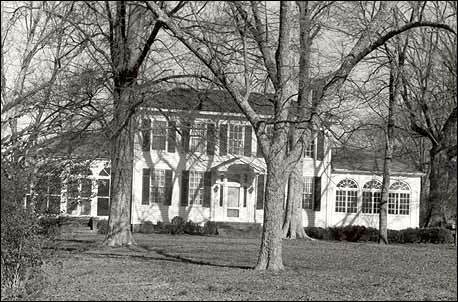 By the time of the relocation, Major Ridge had enlarged the cabin into a fine house, with eight rooms, 30 glass windows, four brick fireplaces, and paneling in the parlor. The two one-story wings were added in the 20th century. "I fought through the War Between the States and have seen many men shot, but the Cherokee Removal was the cruelest work I ever knew." —-Georgia soldier who participated in the Cherokee Removal. "Long time we travel on way to new land. People feel bad when they leave old nation. Women cry and make sad wails. Children cry and many men cry, and all look sad like when friends die, but they say nothing and just put heads down and keep on go towards West. Many days pass and people die very much. We bury close by Trail." —Survivor of the Trail of Tears. In the winter of 1838 the Cherokee began the thousand mile march with scant clothing and most on foot without shoes or moccasins. 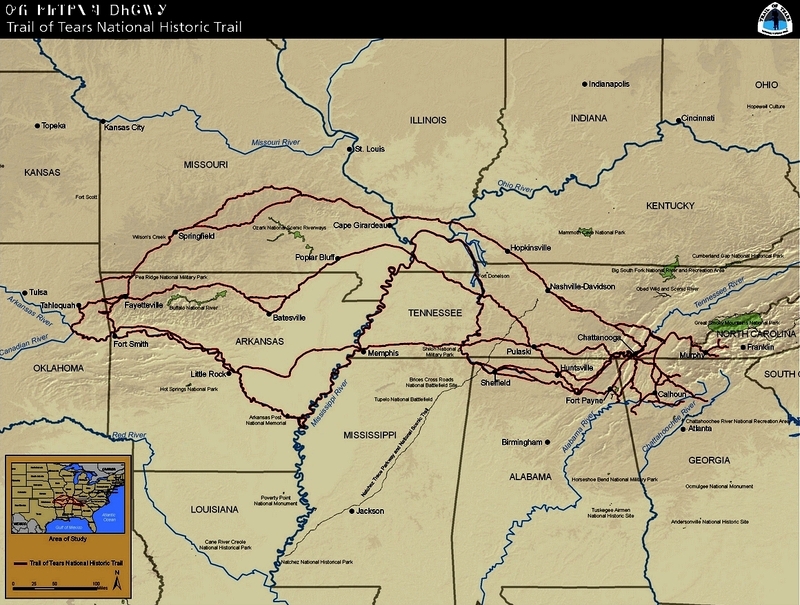 (Cherokee Removal Routes Map and Trail of Tears Mapped Routes.) 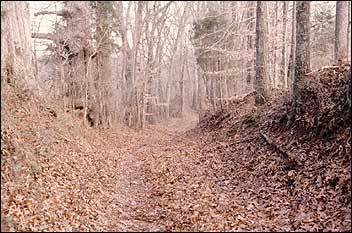 The march began in Red Clay, Tennessee, the location of the last Eastern capital of the Cherokee Nation (Red Clay Council and Red Clay Council Grounds). The Cherokee were given used blankets from a hospital in Tennessee where an epidemic of small pox had broken out. Because of the diseases, the Indians were not allowed to go into any towns or villages along the way; many times this meant traveling much farther to go around them. After crossing Tennessee and Kentucky, they arrived in Southern Illinois at Golconda about the 3rd of December, 1838. Here, the starving Indians were charged a dollar a head to cross the river on "Berry's Ferry" which typically charged twelve cents. They were not allowed passage until the ferry had serviced all others wishing to cross and were forced to take shelter under "Mantle Rock," a shelter bluff on the Kentucky side, until "Berry had nothing better to do". Many, consequently, died huddled together at Mantle Rock waiting to cross. Several Cherokee were also murdered by locals. The killers filed a lawsuit against the U.S. Government through the court house in Vienna, suing the government for $35 a head to bury the murdered Cherokee. On December 26, Martin Davis, Commissary Agent for Moses Daniel's detachment, wrote: "There is the coldest weather in Illinois I ever experienced anywhere. The streams are all frozen over something like eight or twelve inches thick. We are compelled to cut through the ice to get water for ourselves and animals. It snows here every two or three days at the fartherest. We are now camped in Missippi [Mississippi] swamp four miles from the river, and there is no possible chance of crossing the river for the numerous quantity of ice that comes floating down the river every day. We have only traveled sixty-five miles on the last month, including the time spent at this place, which has been about three weeks. It is unknown when we shall cross the river...."
Removed Cherokees initially settled near Tahlequah, Oklahoma. The political turmoil resulting from the Treaty of New Echota and the Trail of Tears led to the assassinations of Major Ridge, John Ridge, and Elias Boudinot; of the leaders of the Treaty Party, only Stand Watie escaped his assassins. The population of the Cherokee Nation eventually rebounded, and today the Cherokees are the largest American Indian group in the United States. There were some exceptions to removal. Perhaps 100 Cherokees evaded the U.S. soldiers and lived off the land in Georgia and other states. Those Cherokees who lived on private, individually owned lands (rather than communally owned tribal land) were not subject to removal. In North Carolina, about 400 Cherokees, known as the Oconaluftee Cherokee, lived on land in the Great Smoky Mountains owned by a white man named William Holland Thomas (who had been adopted by Cherokees as a boy), and were thus not subject to removal. Added to this were some 200 Cherokee from the Nantahala area allowed to stay after assisting the U.S. Army hunt down and capture the family of the old prophet Tsali (Tsali died by firing squad). These North Carolina Cherokees became the Eastern Band of the Cherokee Indian Nation. (Left) William Holland Thomas (North Carolina state senator, Cherokee chief, Confederate colonel) lobbied Washington for the Cherokee to remain in North Carolina and was even on the scene during the 1838 Trail of Tears and persuaded General Winfield Scott, the Indian removal enforcement officer, to allow the Cherokee hiding in the North Carolina mountains to also remain. Without Thomas's intervention at both fronts, there would not be a single Cherokee in western North Carolina. Thomas was our Oscar Schindler, and his significance is reflected with the existence of the present-day Eastern Band of Cherokee Indians. The rare and sought after "Trail of Tears" variety of bean is very productive and was grown by the Cherokee before the resettlement. The Cherokee were able to preserve this heirloom variety of bean during the upheaval. 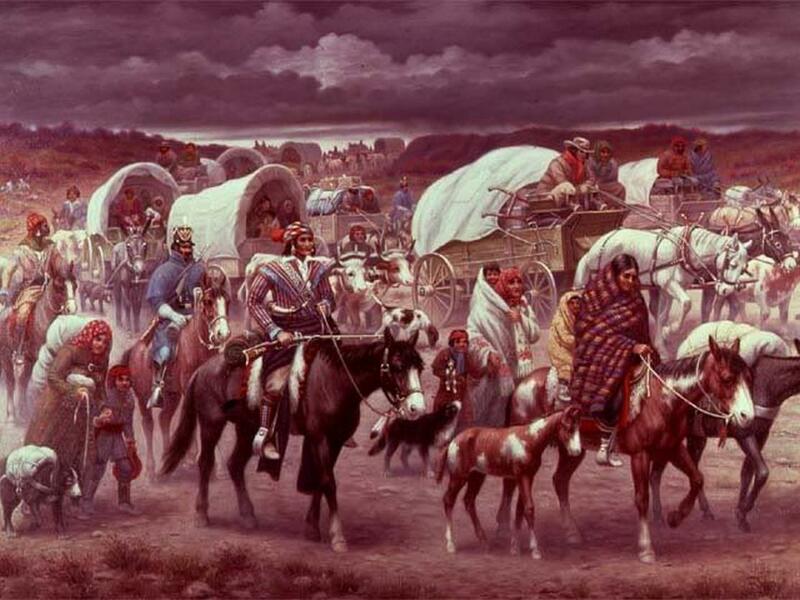 The Trail of Tears is generally considered to be one of the most regrettable episodes in American history. 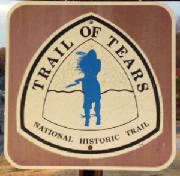 To commemorate the event, the U.S. Congress designated the Trail Of Tears National Historic Trail in 1987. It stretches for 2,200 miles (3,540 km) across nine states. In 2004, Senator Sam Brownback (Republican from Kansas) introduced a joint resolution (Senate Joint Resolution 37) to “offer an apology to all Native Peoples on behalf of the United States” for past “ill-conceived policies” by the United States Government regarding Indian Tribes. The United States Senate has yet to take action on the measure. It progresses from the earliest days, through de Soto, the Indian wars, Tecumseh, the Trail of Tears, the Civil War and ultimately to 1900. Continuing, it explores Cherokee mythology and storytellers. This book is truly monumental in its scope and covers origin myths, animal stories, Kanati and Selu, the Nunnehi and Yunwi'Tsundi (little people), Tlanuwa (thunderbirds), Uktena (horned water snake), interactions with other Nations and numerous other myths, as well as local legends from various parts of the Southeast (North Carolina, Tennessee, Georgia, etc). There is also a section of herbal lore. 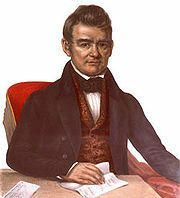 Mooney closes with a glossary of Cherokee terms (in the Latin alphabet rather than the Sequoya Syllabary) and abundant notes. We advance to the next book, Sacred Formulaes of the Cherokee, which covers a number of magical texts amongst the Cherokee Nation. This book does a wonderful job talking about such manuals, mentioning how they were obtained, going into depth about the Cherokee worldview and beliefs on magic, concepts of disease, healing ceremonies, practices such as bleeding, rubbing and bathing, Shamanism, the use of wording, explanations of the formulae and so forth. It then gives an amazingly varied collection of Cherokee formulae, first in the original Cherokee (again, in the Latin alphabet) and then translated into English. Everything from healing to killing witches, to medicine for stick ball games, war and warfare. Both books include numerous photographs and illustrations of famous historical figures, Cherokee manuscripts and petroglyphs and a map of Cherokee lands. Again, this is a truly massive book and even today is considered one of the essential writings of Cherokee religion. Anyone with an interest in the subject, whether anthropologist, descendant of the Cherokee or just a curious person interested in Native culture, should definitely give this book a read. I highly recommend it. Sources: Anderson, William L., ed. Cherokee Removal: Before and After. Athens, Georgia: University of Georgia Press, 1991; Carter, Samuel. Cherokee Sunset: A Nation Betrayed. New York: Doubleday, 1976. ISBN 0-385-06735-6; Ehle, John. Trail of Tears: The Rise and Fall of the Cherokee Nation. New York: Doubleday, 1988. ISBN 0-385-23953-X; Fitzgerald, David G. and King, Duane E., The Cherokee Trail of Tears, Graphic Arts Books, Portland, OR, 2005; Foreman, Grant. Indian Removal: The Emigration of the Five Civilized Tribes of Indians. Norman, Oklahoma: University of Oklahoma Press, 1932, 11th printing 1989. ISBN 0-8061-1172-0; Prucha, Francis Paul. The Great Father: The United States Government and the American Indians. Volume I. Lincoln, Nebraska: University of Nebraska Press, 1984. ISBN 0-8032-3668-9; Remini, Robert V. Andrew Jackson and his Indian Wars. New York: Viking, 2001. ISBN 0-670-91025-2; Wallace, Anthony F.C. The Long, Bitter Trail: Andrew Jackson and the Indians. New York: Hill and Wang, 1993. ISBN 0-8090-1552-8 (paperback); ISBN 0-8090-6631-9 (hardback); Anderson, William L., ed. Cherokee Removal: Before and After. Athens, Georgia: University of Georgia Press, 1991; Carter, Samuel. Cherokee Sunset: A Nation Betrayed. New York: Doubleday, 1976. ISBN 0-385-06735-6; Foreman, Grant. Indian Removal: The Emigration of the Five Civilized Tribes of Indians. Norman, Oklahoma: University of Oklahoma Press, 1932, 11th printing 1989. ISBN 0-8061-1172-0; King, Duane and Fitzgerald, David G., The Cherokee Trail of Tears, Graphic Arts Center Publishing Company, Portland, OR, 2007. ISBN 1-55868-905-3; Wallace, Anthony F.C. The Long, Bitter Trail: Andrew Jackson and the Indians. New York: Hill and Wang, 1993. ISBN 0-8090-1552-8 (paperback); ISBN 0-8090-6631-9 (hardback); National Park Service; Library of Congress; 1835 Treaty of New Echota; 1830 Indian Removal Act; Winfield Scott's Address to the Cherokee Nation, May 10, 1838; Winfield Scott's Order to U.S. Troops assigned to the Cherokee Removal, May 17, 1838; Removal of the Indians, by Lewis Cass, January 1830; Cherokee Indian Removal Debate U.S. Senate, April 15-17, 1830; Elias Boudinot’s editorials in The Cherokee Phoenix, 1829-31; Trail Of Tears National Historic Trail; New Echota Historic Site; Trail of Tears Commemorative Park, Hopkinsville KY; Cherokee Nation, Oklahoma; Eastern Band of Cherokee Indians, North Carolina; Burnett, John G. 1978 "The Cherokee Removal through the Eyes of a Private Soldier." Journal of Cherokee Studies 3 (Summer): 180-85; Buttrick, Daniel S. 1838-39 Diary. Houghton Library, Harvard University; Cannon, B. B. 1978 "An Overland Journey to the West (October-December 1837)." Journal of Cherokee Studies 3 (Summer): 166-73; Deas, Lt. Edward 1978 "Emigrating to the West by Boat (April-May 1838)." Journal of Cherokee Studies 3 (Summer): 158-63; Foreman, Grant 1932 Indian Removal -The Emigration of the Five Civilized Tribes of Indians. Norman: University of Oklahoma Press; _____. 1932 The Five Civilized Tribes: A Brief History and a Century of Progress. Norman: University of Oklahoma Press; Henegar, H. B. 1978 "Recollections of the Cherokee Removal." Journal of Cherokee Studies 3 (Summer): 177-79; Hudson, Charles 1976 The Southeastern Indians. Knoxville: University of Tennessee Press; King, Duane H., and E. Raymond Evans, ed. 1978 "The Trail of Tears: Primary Documents of the Cherokee Removal." Journal of Cherokee Studies 3 (Summer): 131-90; King, Duane H. 1988 Cherokee Heritage: Official Guidebook to the Museum of the Cherokee Indian. Cherokee, NC: Cherokee Communications; Lightfoot, B. B. 1962 "The Cherokee Emigrants in Missouri, 1837 -1839." Missouri Historical Review 56 (January): 156-67; Morrow, W. I. I. 1839 Diary. Western Historical Manuscript Collection, University of Missouri, Columbia; Mooney, James 1975 Historical Sketch of the Cherokee. Chicago: Aldine Publishing Company; Moulton, Gary E. 1978 John Ross: Cherokee Chief. Athens: University of Georgia Press; Perdue, Theda 1989 The Cherokee. New York: Chelsea House Publishers. Prucha. Francis Paul 1969 "Andrew Jackson's Indian Removal Policy: A Reassessment." Journal of American History 56 (December): 527-39; Scott, Winfield 1978 "If Not Rejoicing at Least in Comfort." Journal of Cherokee Studies 3 (Summer): 138-42; Starr, Emmet 1921 History of the Cherokee Indians and Their Legends and Folk Lore. Oklahoma City: The Warden Company; Thornton, Russell 1984 "Cherokee Population Losses during the Trail of Tears: A New Perspective and a New Estimate." Ethnohistory 31 (4): 289-300. 1990 The Cherokees: A Population History. Lincoln: University of Nebraska Press; Wilkins, Thurman 1986 Cherokee Tragedy: The Ridge Family and the Decimation of a People. Norman: University of Oklahoma Press; Woodward, Grace Steele 1963 The Cherokees. Norman: University of Oklahoma Press.